Home / Articles / Arts & Entertainment / Celebrities / Three Cheers for Mickey! What would it take to return to that childlike wonder, where every moment was a surprise, offering something new and exciting? When the little things were meaningful, and it was easy to be filled with joy and wonder…. As I write this article, it is exactly two weeks from Election Day, and we are barraged with insults, indignations, and in my opinion, injury. We’ve witnessed the worst campaign battle to date, so what’s this writer to do? Here at the Happy Herald, both honoring where we are and where we need to go, we felt a trip back in time, when it was easy to smile and feel the goodness in the world, would be most beneficial! Looking ahead, no one knows what will be. We can only bring, as Oprah says, Our Best Self forward. Show me a picture of Mickey or Minnie Mouse and I’m transported. So for the next moment or two, activate a memory to open your heart, and allow the good feelings to roll in. Indulge in remembering your first Mickey Mouse experience or look at the cover photo and feel your own childlike wonder again. Let the world of today, fall away… just for a second, be free. Here’s some quick trivia: Mickey Mouse is the official mascot of The Walt Disney Company. He was created by Walt Disney and Ub Iwerks at the Walt Disney Studios in 1928. An anthropomorphic mouse who typically wears red shorts, large yellow shoes, and white gloves, Mickey has become one of the world´s most recognizable characters. Mickey officially debuted in the short film Steamboat Willie (1928), one of the first sound cartoons. He went on to appear in over 130 films. Ten of Mickey´s cartoons were nominated for the Academy Award for Best Animated Short Film, one of which, Lend a Paw, won the award in 1942. In 1978, Mickey became the first cartoon character to have a star on the Hollywood Walk of Fame. Beginning in 1930, Mickey has also been featured extensively as a comic strip character. His eponymous(e) newspaper strip, drawn primarily by Floyd Gottfredson, ran for 45 years. 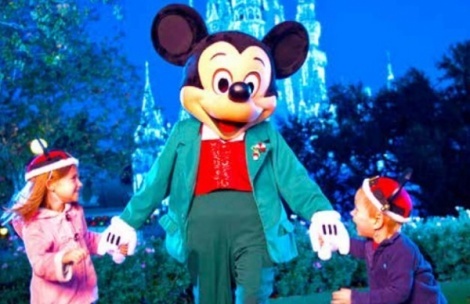 Mickey has also appeared in comic books and in television series such as The Mickey Mouse Club (1955– 1996) and others. He also appears in other media such as video games as well as merchandising, and is a meetable character at the Disney parks. Mickey generally appears alongside his girlfriend Minnie Mouse, his pet dog Pluto, and his friends Donald Duck and Goofy. He was originally characterized as a mischievous antihero, but Mickey was rebranded over time as an Everyman, usually seen as a flawed, but adventurous hero. I’m all for Mickey saving the day but this month, the month where we select our new President, honor our veterans and celebrate Thanksgiving… it’s up to you. Bring your best self, make wise choices, cast your vote and let’s together give three cheers for Mickey: M-I-C, see ya real soon… K-E-Y, why, because WE LIKE YOU… M-O-U-S-E! Have fun, sing a song or two and be in the childlike wonder of life… Woohoo!